National Youth Week is an opportunity for young people to express their ideas and views, act on issues that affect their lives, and to celebrate the contribution of young people around Australia. At CREATE, we are focusing our Youth Week celebrations on recognising Australians who have a care experience and who are preparing to leave care and how we can support them. 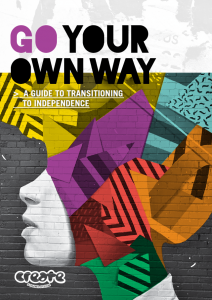 As part of Youth Week, we launch our new Go Your Own Way (GYOW) video showcasing some amazing young people who have transitioned from care talking about their experiences leaving care, and the benefits of CREATE’s GYOW kit. CREATE has distributed over 2,600 GYOW kits to young people preparing to transition from care since they were developed in 2013. The GYOW Kit is an easy to use resource for young people preparing to transition to independence. The kit contains a workbook with loads of information about what young people need to know, as well as a checklist, USB and frisbee – all packed into a handy carry bag. CREATE produces the GYOW kits in line with funds available. For more information about getting a hard copy of the GYOW kit please email create@create.org.au or to download a digital copy of the workbook, please click on the thumbnail of the Go Your Own way workbook.